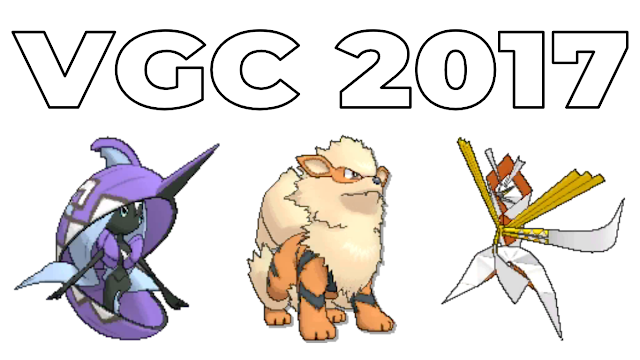 I'm starting a new series, where the goal is to talk about a core that's doing well in the VGC 2017 format and tell you everything you need to know about it, while also providing some possible team building ideas if you get stuck. Today, we'll be talking about the AFK core, which consists of Arcanine, Tapu Fini, and Kartana. This Fire/ Water/ Grass core has been performing well in the VGC 2017 format so let's cover it and I hope you enjoy. Similar to the Heatran / Rotom-Wash / Mega Venusaur of 2015, this is a bulky Fire/Water/Grass core meant to control the game through a mixture of weakening your opponent's ways of damage and shutting down their options in a variety of ways, including eliminating status ailments from the battle through Tapu Fini's Misty Surge ability that sets Misty Terrain on the field and prevents any grounded Pokémon from being affected by status, Arcanine's Snarl/Intimidate combo to weaken all physical and special attacking moves used by the opponent, and Kartana's strong coverage moves to cause major damage which the support provided by Tapu Fini and Arcanine makes Kartana bulkier than it already is. This allows these 3 Pokémon to form a strong defensive core that can slow the state of the game, which favors the bulkier team most of the time. Sample sets for these 3 Pokemon. This is a supportive Arcanine used by Till Boomer (@Dark_Psiana) to finish 12th at the London International. This Arcanine was meant to use Will-O-Wisp to weaken physical attackers like Garchomp, as well as its Intimidate ability to weaken its further, while also using Snarl to weaken special attackers so none is safe. You also have Flamethrower as a strong STAB move. The EV Spread was mean to allow Flamethrower to have a 93.8% chance to 2HKO 180 HP / 148 SpD Celesteela. It also allows Arcanine to have a 6.3% chance to survive 252 SpA Nihilego Power Gem and is 2HKO'd by -1 Earthquake from Garchomp thanks to the Sitrus Berry. The speed EVs are so Arcanine can outspeed max speed Xurkitree. I'll link the team report here so you can get a better idea of Till's Arcanine from his point of view. Because the team has Tapu Fini, there's an option to use Roar over Will-O-Wisp as you can Roar a Trick Room setter because Roar has -6 priority and Trick Room has -7 priority. This was the Assault Vest Kartana set that was created by Ray Rizzo. He made a video, which I'll link here. This set works well with Arcanine and Tapu Fini as Arcanine can use Snarl, Intimidate, and Will-O-Wisp to weaken the power of their attacking moves, which in turns makes Kartana bulkier overall. Some important offensive damage calcs that Ray went into our how at +1 Attack thanks to Beast Boost Leaf Blade can KO 4 HP / 0 Def Tapu Koko and Smart Strike has a 93.8% chance to KO 252 HP / 0 Def Tapu Bulu. Kartana still has a lot of damage output as Ray noted as it still has a base 181 Attack stat and will still be providing damage. Defensively, this Kartana can survive Tectonic Rage from 252 Atk Garchomp, Hydro Vortex from 252+ SpA Golduck in the Rain, and Fire Fang from 252 Atk Garchomp. Coverage wise, this Kartana can hit every Pokemon in the format for at least neutral damage, which always allows it always have a move to on each Pokemon. This is a bulky Tapu Fini set meant to allow Tapu Fini to use Calm Mind to increase both its Sp. Attack and Sp. Defense by 1 stage each, allowing it to increase its damage output and take crucial hits, like Tapu Koko's Thunderbolt, which out of the Electric Terrain and at +1, which is a 3HKO. Muk's Poison Jab at -1 is a 3HKO, and Celesteecla's Heavy Slam is a 31.3% chance to be a 2HKO. The HP stat is to optimize Leftovers recovery. The 12 Speed EVs is to speed creep other Tapu Fini. At +1 Sp. Attack, Tapu Fini's Muddy Water is a OHKO and a 81.3% chance to KO Alolan Marowak. The goal is to maximize how long Tapu Fini stays on the field and use Muddy Water and Moonblast to cause damage, while providing the Misty Terrain so it can prevent status ailments on your Pokemon so they can't use Toxic on your Tapu Fini or Will-O-Wisp on your Kartana. - Because this core is in the middling speed, Pokemon like Snorlax are very helpful as it can deter the opponent from using Trick Room as they'll have to deal with a very strong and slow Pokemon. - Garchomp is a very fast Pokemon as it provides a Z-Move slot on the team and can give the team a much needed fast option. - Muk can provide a team a great answer versus the 4 Tapu Pokemon as Muk can provide strong Poison type moves. - Porygon2 can provide a strong Trick mode and allows the team to open up a Trick Room mode. - Gigalith can provide the Sand, while also supporting the Trick Room mode if you add Porygon2 and fast weather setters like Ninetales, Politoed, & Pelipper will have their weather overridden. - Garchomp is a fast Pokemon that can carry Fire Fang to deal with Kartana, oftens carries Tectonic Rage to deal with Arcanine, and can do a lot of damage to handle Tapu Fini. - Tapu Koko can do a lot of damage to these Pokemon and the only Pokemon that may give Tapu Koko trouble is Kartana, which can Smart Strike for a lot of damage and Arcanine can use Snarl to weaken it's Thunderbolt. I hoped you enjoyed this article. Overall, this is a very strong core that has a ton of success and will see this success in the future. Check out my older content and let me know what your opinions on this core. See you guys next time. Bye!